A promenade, as defined by Merriam-Webster, is a “public place for walking.” A proposed promenade in D.C.’s Eckington neighborhood, however, is for everybody — two feet, two wheels, four wheels. 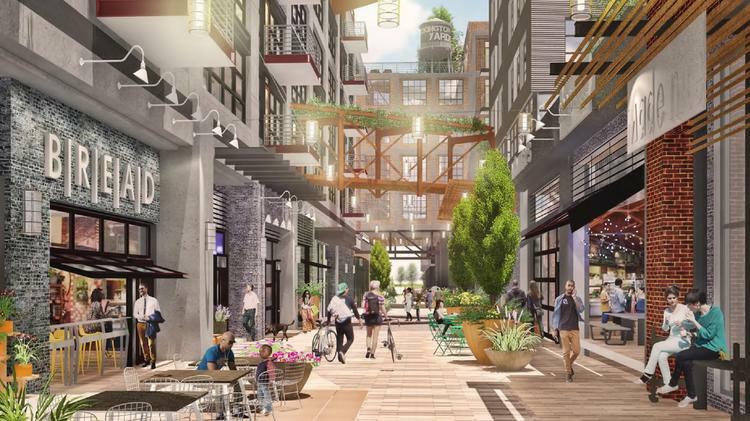 The focal point of Eckington Yards, a huge mixed-use development planned for a 3.1-acre site near the New York Avenue intersection with Florida Avenue NE, is the promenade. Linking Eckington Place and Harry Thomas Way, with a central plaza toward the middle, the promenade is a retail and residence-lined avenue designed as an active space, largely for pedestrians and cyclists. But cars and trucks, those will share the private street as well — when it’s not closed to traffic during peak periods or events — despite the lack of any parking, curbs or curb cuts. And that was the subject of some concern among D.C. zoning commissioners during the May 12 hearing on the project. Commissioners questioned pedestrian safety and enforcement of no parking and other traffic rules. Those will be discussed further on Monday, when the commission considers the project possibly for the final time. Eckington Yards, from The JBG Cos. and the Boundary Cos., will total 695 units (56 affordable) in four connected buildings, upward of 80,000 square feet of retail (including a newly added cafe space fronting Harry Thomas Way and the planned NoMa Green), more than 330 underground parking spaces and the promenade. Much of the retail space is envisioned as “maker use space,” targeted to businesses such as distilleries, textile makers and sculptors. The development will sit adjacent to JBG’s The Gale, a 603-unit building at 151 Q St. NE. While titled the Eckington Place Promenade, the development team, with architects Eric Colbert & Associates and LandDesign, describes the space as a “shared street,” not unlike Cady’s Alley in Georgetown, Ellsworth Drive in Silver Spring, Harvard Square in Cambridge, Massachusetts, or the Festival Streets of Portland, Oregon. Dan VanPelt, a principal with Gorove/Slade, the Eckington Place transportation planner, said the promenade will not serve through traffic — it runs east-west, one way. “We see it as a pedestrian street, as a place that will be activated by outdoor dining, pedestrians, people,” said Bryan Moll, JBG principal. Events planned for the street include farmers’ markets, pet adoptions, artist shows and fairs, outdoor movies, and community “do-it-yourself” nights with commercial maker tenants. When it is closed to traffic, bollards and other movable fixtures will be placed at the entrance, blocking vehicles. But because retail and residential lobbies will be located along the promenade, and some units will have direct access from it, the street must be accessible for drop-offs, pick-ups and deliveries. The Eckington Yards promenade will be a tow away zone, with a speed limit of 5 mph. Deliveries will be limited to trucks that are less than 35-feet long. According to a Gorove/Slade memo to the Zoning Commission on shared roadways, the relatively modern concept “relies on social interaction to a greater degree than traditional traffic controls.” Shared roadways usually have no curbs, a lesser amount of traffic signs and markings, and slow speeds for all modes of travel. The roadway versus the pedestrian area are defined by varying colors of pavement, rather than sidewalks and curbs.